SANSON - [ Dedication addressed to Monseigneur Le Tellier ]. SANSON, N. - [ Dedication addressed to Monseigneur Le Tellier ]. 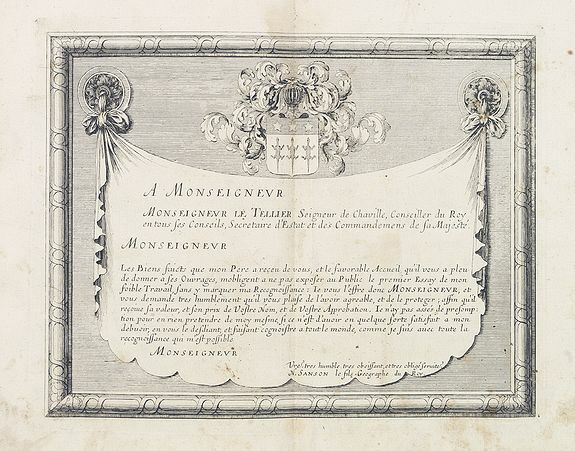 [ Dedication addressed to Monseigneur Le Tellier ]. - SANSON, N.
Title : [ Dedication addressed to Monseigneur Le Tellier ]..
Map maker : SANSON, N.. Size : 7.3 x 9.3 inches. / 18.5 x 23.5 cm. Description :Dedicational leaf from an atlas by N. Sanson to François Michel Le Tellier, (18 janvier 1641, Paris - 16 juillet 1691, Versailles). Le Tellier was a French statesman, and minister of state under Cardinal Mazarin , he became war minister in 1643. At the time of his death he was chancellor of France. Condition : Some spotting on printed area as well as along margins. Else a good and dark impression.